20/10/2013 · Pre-heat the (fan) oven to 180C. Place the prepared beetroot on a tray lined with baking paper. Roast in the oven until the beets are tender enough to allow a knife pierce through, still bitey but yielding to the knife.... Cooking Beetroot So many of my friends opt to peel, chop and roast their beetroot with other vegetables in the oven; whilst this works for some, I often find this means that the beetroot ends up dry and tasting a little on the “earth-y” side. Bake: Preheat oven to 170C/325F/Gas 3. 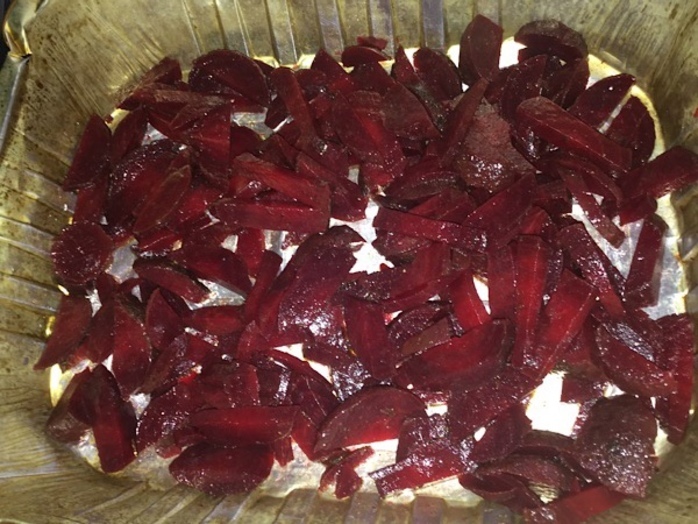 Put the whole beets into a baking dish, cover with foil and cook for 1-2 hours (depending on the size of the beets). Leave till cool enough to handle, and remove the skins - they should slip off easily.... Bake: Preheat oven to 170C/325F/Gas 3. Put the whole beets into a baking dish, cover with foil and cook for 1-2 hours (depending on the size of the beets). Leave till cool enough to handle, and remove the skins - they should slip off easily. Wrap the beetroot in foil and pop into an oven preheated to 180C. Leave to roast for 45 minutes before removing from oven. Leave to roast for 45 minutes before removing from oven. Open the foil and allow the beetroot to cool until you can touch it.... 18/07/2018 · Peel the beetroot. Use a vegetable peeler to peel the skin off the beetroot. Stand over the sink as you work to allow the peeled pieces to fall into an easy-to-clean spot. Wrap the beetroot in foil and pop into an oven preheated to 180C. Leave to roast for 45 minutes before removing from oven. Leave to roast for 45 minutes before removing from oven. Open the foil and allow the beetroot to cool until you can touch it. Start by preheating the oven to 150°C whilst you prepare the beetroot. Wash and peel your beetroot and then, with the help of a potato or mandolin peeler if you have one to hand, cut the beetroot into very thin slices. Alternatively, you can steam whole beetroot or bake them in the oven for 2–3 hours at 150°C/gas mark 2. The best way to tell if a beetroot is cooked is to rub it with your fingers; if the skin moves, then the beetroot is cooked. Bake: Preheat oven to 170C/325F/Gas 3. Put the whole beets into a baking dish, cover with foil and cook for 1-2 hours (depending on the size of the beets). Leave till cool enough to handle, and remove the skins - they should slip off easily. Stir in the grated beetroot and then add the sugar to balance the savoury flavour of the seeds, season with salt and pepper and cook for 1 minute. Add Balsamic vinegar to the mixture and cook for approximately 10 minutes until it is a jam-like consistency.